Want to become less reactive and more mindful? Want to feel, think and act from your higher self? 1. Interrupts the chatter of your worried mind. 2. Delivers you to the present moment. make choices in line with your highest good. "This is wonderful... I have been asking people to begin thinking about how to use technology in order to help us to disconnect from technology and connect with ourselves." from his compassionate, loving, powerful and passionate self. Why is it so hard to live from our highest good all the time? Our brains are programmed to conserve energy by automating our feelings thought and actions. Most of these patterns were instilled in us when we were children. It takes constant awareness, commitment and tenacity to create new, more conscious, ones. There is a part of our brains that constantly anticipates problems and tries to solve them in advance. Its primary concern is survival; it obsesses about the future and regrets the past. It hijacks us from fully experiencing and appreciating all that life has to offer us in the present moment. In any given moment, we are usually unaware of the feelings we are having; yet those feelings greatly affect our thoughts and actions. Our lives are at the mercy of our emotions very much like a sailor sailing a boat without understanding how the wind affects its movement; external forces will frustrate any course you set. How does the AWARENESS app work? 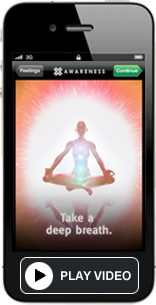 The app sounds a gentle gong several times a day to remind you to connect to yourself. Then it tracks and records your feelings along with your activities. As you continue to connect with and record your feelings, you will start to discover patterns between your feelings and activities so that you can change unwanted habits and lead a more impactful life. Why does the AWARENESS app work? Over the last two decades, the use of brain scanning technology has conclusively revealed the brain's capacity to change its structure based on new experiences. New breakthroughs in neuroscience are continuing to reveal the extent to which our brains can rewire themselves and reshape our feelings, thoughts, behaviors and abilities. Using this application consistently over time will rewire your brain and increase your consciousness and overall well-being in your daily life. Sharing AWARENESS with others in your life and practicing together will help humanity leap forward to our next stage of human consciousness.